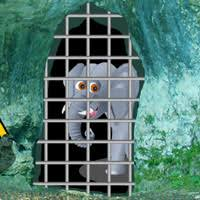 Games2Rule - G2R Baby Elephant Forest Rescue Escape is another point and click escape game developed by Games 2 Rule. In this game, you came to see the beauty of a forest. But unfortunately, you noticed that someone trapped a baby elephant. You need to rescue the baby elephant from the forest by finding useful objects, hints and by solving puzzles. Click on the objects to interact with and solve puzzles. Good luck and have fun! Sometimes you have to go all the way back from third set to first set of scenes to use items. I noticed, Burgers. Nice game. Thanks G2R. Can someone spoil the math? It isn't a perfect magic square; you don't do the diagonals. I didn't realize the only digits were 1-4. It's more a sudoku than math. Again the story with unprecise clicks and a bit laggy. G2R, do you think it's more exciting like this? IT IS NOT!